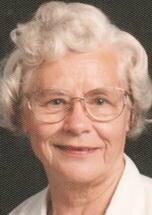 WATERLOO - Donita M. Blood, 98, of Des Moines, formerly of Waterloo, died Tuesday, Oct. 22, 2013, at Ramsey Village, Des Moines. She was born Jan. 7, 1915, in Waterloo, daughter of Lloyd and Maude Barclay Smith. She married Thomas W. Blood in Rochester, Minn., in 1934. He died July 18, 1989. She graduated from West Waterloo High School in 1933 and then worked for three years as a secretary for the Waterloo School System. She sang with the PTA Mothers Singers, the Waterloo Mothers Chorus and 51 years in the choir at Central Christian Church. She was a den mother, Girl Scout leader, and was a first aid instructor with the American Red Cross. She also taught Sunday School at Central Christian Church. Survived by a son, Thomas E. III (Carmen) of Sun Prairie, Wis.; a daughter, Phyllis (Terry Melton) Blood of Des Moines; six grandsons; 20 great-grandchildren; and four great-great-grandchildren. Preceded in death by a daughter, Suzanne Remington; three brothers; and two sisters. Services: 11 a.m. Saturday at Central Christian Church (Disciples of Christ), preceded by an hour of visitation, with burial in Elmwood Cemetery. Locke Funeral Home is in charge of arrangements. Memorials in lieu of flowers may be directed to the church or Ramsey Village, 1611 27th St., Des Moines. She moved to Des Moines in 2008 where she resided at Ramsey Village. The family thanks the staff for the loving care they helped provide during the last years of her life.